I heard the name Carrie Ryan probably a year ago. Since hearing her name and before reading her work, I assumed she wrote zombie stories from what I've heard about her. But to call THE FOREST OF HANDS AND TEETH simply a zombie story, I think, would be a disservice to her work. It's more complicated than that. I have now read one novel and Bougainvillea,a short story, by Ms. Ryan and yes, her stories have zombies in them, but she writes about much larger topics. Topics like the possible perils of following organized religion to the point that you lose your own free will, standing up for what you know is right, and following your dreams. Mary, the main character of THE FOREST OF HANDS AND TEETH, is fifteen and lives in a village some time in the future. The village is surround by a fence because flesh-hungry zombies, in this story named the Unconsecrated, roam the forest, thus THE FOREST OF HANDS AND TEETH. Mary has lived all her life behind this fence, but is starting to question what is beyond it. Her mother has told her stories that have been handed down through the generations about a large body of water called the ocean. Mary, (I don't it's a coincidence that she shares a name with the mother who gave birth to another religion,) dreams of one day finding this ocean and believes it may be at least one place where the Unconsecrated do not roam. Another facet of the story early on is the Sisters, the religious body of this village, the educators, and also the makers of the law. They discourage free thought and use God as a tool to make people submit to their rules. It's almost like Mary is Copernicus living in a Ptolemaic Universe. When she talks of one day visiting this ocean, people hush her for fear of the Sisters or dismiss it as a childish fantasy. Without saying too much, the Sisters go as far, at one point, to use scare tactics to try and get Mary to submit to their ways. I'm not sure if Ms. Ryan is familiar with Plato's allegory of the cave, but I assume having graduated from Duke's School of Law, she has come across it at one point or another. I also got the impression that Mary was the only one in her village with dreams. Everyone else was either too fearful of the Sisters or the Unconsecrated to follow their and appear happy with the Status Quo. There is a real fear in the village of the Sisters. A blurb from the cover calls it a postapocalyptic romance. There is a little romance between Mary and a boy named Travis, but despite the chaos that surrounds her, she is willing to risk the relationship if it stands in the way of her getting to the ocean. Her father is killed by the Unconsecrated early on. Her mother goes to the fence and is bitten. It's not clear if she does this intentionally because she misses her husband so badly, but Mary speculates, I wonder now, if she (her mother) didn't leave because of us. Because of Jed (her brother) and me. But in my heart I know that's not the case. She didn't leave in search of the ocean because of my father. Because he was enough for her. Enough to keep her snug within the fences her entire life. I love that passage and sums up, for me, why Mary will never be happy with Travis or anyone else in her village. She needs to follow her dreams. She's willing to risk everything, her love and even her life, for a world that is not dominated by the Sisters or the Unconsecrated. I love this book. Can't wait to read the second one. And would highly recommend it to any serious reader. In Mary's village, the Sisterhood guides the people. Guardians and fences serve to protect the villagers from the Unconsecrated --- the undead hordes hungering at the fences. Once bitten by one of the Unconsecrated, a victim will join these zombies that rage through the forest surrounding the village. Mary's father has become one of the Unconsecrated and she worries that her mother's grief may cause her to do something insane. On the day Harry asks Mary to go to the Harvest Celebration with him, she has a huge decision to make. After all, if she agrees to accompany him, she is essentially agreeing to marry him. Mary likes Harry, but she is in love with his brother. But Harry unknowingly breaks her heart when he informs her that his brother is going to the Celebration with Mary's best friend. At that moment, the village siren sounds. Have the fences been breached by the Unconsecrated? Mary discovers, to her grief and horror, that her mother has been bitten and infected by one of the Unconsecrated --- and that she has chosen to be turned out into the forest with the other zombies rather than dying immediately. Mary stays with the Sisters. While working through her sorrow, she ponders the stories her mother once told her --- tales of an ocean, something Mary can barely comprehend. Is there still an ocean somewhere past the forest? Could there be other people beyond their forest? Soon, Mary is drawn into a possibly hopeless romance. She glimpses a mysterious stranger, hidden from the others. And then she finds herself on a breathless life-or-death quest. THE FOREST OF HANDS AND TEETH is a gorgeously written story that is filled with bleakness yet leavened with hope. It is part horror tale, part coming-of-age yarn, part romance, and part adventure story . . .adding up to a page-turner that is nearly impossible to put down. This was my favorite of Carrie Ryan's book. It had a pretty good plot kinda unusual for the post zombie takeover world. Low on the sappy romance stuff that always seems to ruingood horror books. worth a read fo who! 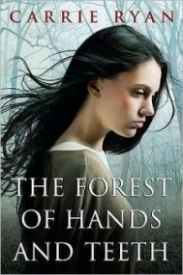 Dark and haunting, The Forest of Hands and Teeth was an emotional rollercoaster. At times, fear consumed me, and at other moments, I was overwhelmed with sorrow. But I was certain about one thing: The Forest of Hands and Teeth is an unforgettable novel, one that may catch up to you in your dreams … or your nightmares. When I first cracked open this novel, I was struck by how similar the world of the Forest of Hands and Teeth was to the world of Ann Aguirre’s Enclave. However, before you begin pointing fingers at Carrie Ryan, note that her novel was published in 2009, whereas Enclave was published in 2011. In addition, I did find differences in the two novels; for example, the zombies in the Forest were dubbed “the Unconsecrated” and were created by “Infecting” a human with a single bite, whereas those in Enclave were called Freaks and had no known origin. The societies in both books were also incredibly different; the Forest included the Sisterhood and the Guardians, unlike Enclave’s society of Breeders, Builders, and Hunters. The world of the Forest can be described with one word—frightening. Imagine a village enclosed within a fence, and beyond that there is only the Forest. A Forest of zombies craving to feed on human flesh. The life that the villagers lead in the society is purely to survive. Love is second to commitment in marriages, and the Guardians serve to protect while the Sisters keep secrets from the villagers. Add in those insane zombies trying to claw their way into the village (oh, yeah, and if they manage to bite you, you’ll die and turn into a zombie), and you’ve got yourself a dark postapocalyptic novel. In other words, I loved this account of the zombie apocalypse. It’s nice to get a haunting novel every so often. While I may have loved the world Carrie Ryan created, I was not so much a fan of the characters. Though realistic (and I love realistic characters), the main character, Mary, was incredibly selfish. I loved that she was curious, always wondering about a world beyond her secluded village, but so much that that idea consumed her? She paid no attention to her best friend, her older brother, the two boys who loved her, and her own mother. And by the time she realized how much they meant to her, she had lost them all. I was disgusted with Mary, true, but I absolutely loved the boy she fell in love with. He understood her ever so well, and he always wished for her happiness. But I think I really fell in love with him when (spoiler!) Mary had to kill him. Because who doesn’t long for happy endings? The Forest of Hands and Teeth enraptured me from its first word; Carrie Ryan’s dark style of writing created a bleak world caught in the aftermath of a zombie apocalypse. I guarantee that you will not be able to set down this haunting novel. I'm having trouble deciding if I liked this book or not. It had a great plot that really kept me reading, yet sometimes Mary(the main character) really annoyed me. She was very selfish. Also it was very sad and gruesome, but while I didn't like that, I did like it at the same time, it was interesting to read a book without a completly happy ending, where the romance is doomed almost from the start. I didn't like the take the book had on God, as though he didn't exist and the only thing you can have faith in is your dreams. All in all though it was an interesting read that was out of my element, something I normally would never pick up. Maybe that is another reason I didn't absolutly adore it. I would recommend reading it if you want to read something that is different from most books, that has an extremely bittersweet ending, and a fascinating plot. Okay. So this is the first, and only, zombie book I have ever read. It wasn't just about zombies. It was a story of love, family, and the true meaning of survival. It was absolutely beautiful and I couldn't stop reading once I started! I want to read the second novel in this series, but it is not the same group of characters. I may read it, though. Buy this book right now. There isn't much else to say. It is one of my favourite books and I can guarantee you an eventful afternoon on your couch if you choose this book. The plot is unbelievably fast paced. The entire book took me 2 hours to read because I literally could not put it down. There is not an instant where the characters are just sitting down, there is nonstop action. I have mixed feelings about this book. I enjoyed it for the most part, but I can’t say that I loved it. In fact, I’m a little disappointed. I have been reading so many raves about this series, that I just knew it would be great. And the first half of the book was great. Then, I spent 100 pages feeling as if I was reading the same story over again. It was too repetitive for me. I almost put the book back on my bookshelf to finish at a later time because I had lost interest. Luckily, the last 50 pages or so were interesting enough to make me want to finish reading. Since I have mixed reviews, I should tell what I liked and disliked about the book. On a positive note, there was ample character development. More than ample, actually. I really felt like I knew Mary. She was a complicated character, constantly changing throughout the story. I loved that she was conflicted for almost the entire book. She did not have a simple life or easy choices to make, and the author made sure we understood that. The love triangle that she found herself was very complicated. (Complicated is an understatement, actually.) I also liked the fact that Mary knew what she wanted for her life (for the most part). She never gave up on wanting to see the ocean, even when everyone around no longer believed it existed. That really shows her commitment and courage. She holds the hope that the others do not have. Another character that I liked was Travis. He was the broody male figure throughout most of the book. While he didn’t say much, he shows that actions speak louder than words. It’s easy to see how Mary fell deeply in love with him. What really makes me appreciate Travis’s role is that fact that he is a broken man. He’s not the typical strong, healthy hero. He has a lame leg that limits much of what he can do, even the simple things like climbing stairs. If he were strong and healthy like the others I don’t think his character would have worked as well. There needed to be something physically wrong with him to help illustrate Mary’s strong and dedicated character. They were the perfect support—in many ways—for one another. Along with the characters, the idea behind the story was decent. I’m not much of a fan of postapocalyptic literature, but I bought in to this book. The “zombies” walking around trying to kill the humans held my interest. It was an original take on zombies, at least with my reading experience. Also, I enjoyed looking for the subtle hints of our civilization while I read (i.e. references to New York, Coney Island, roman numerals, Shakespeare). It helped me understand just how far into the future the events in the book were supposed to occur. But that’s pretty much where my fondness ends. The plot (for me) was only so-so. It started strong, but it fizzled in the middle. I began feeling like I was reading the same thing over and over again: “Oh, the Unconsecrated are coming!” “We have to turn back.” “Why? !” I can only read those lines so many times before they become stale. I understand the purpose—the characters’ questioning of themselves and their situation is crucial to the theme in the book—but I really feel like it was over done. In fact, what started as a quick paced plot began to lag in the middle of the book because of all the repetitiveness. As I said earlier, I almost gave up on the book. Luckily things do turn around and the plot picks back up. As soon as Mary makes her final decision, the plot picked back up. Unfortunately, that was the end of the book. There were only around 20 pages remaining in the book at that point. I enjoyed reading most of this book, however I have to admit up front that I was disappointed with a few aspects. First, the world Carrie Ryan created was pretty damn cool - apparently I have a secret desire to live within a bizarre and totally oppressive society. Unfortunately, my need for details was not fulfilled and though the world within the fence was totally fascinating to me, it wasn't enough for the main character, Mary. I guess the disconnect I feel is when Mary is living with the Sisterhood (which provides some hairy scenes that made my heart race with anxiety), but the whole time Mary is there she is thinking about a guy and the ocean. I wanted her to be more interested in the mysteries right in front of her. She seemed interested, but not interested enough to really sneak around and get the answers I wanted. It was like she was preoccupied and I couldn't get her to focus. Focus on the basement of the Church Mary! Get me what I need! Otherwise, this was a pretty fun zombie read for me. I've read almost nothing on zombies so this was a good transition because while zombies (Unconsecrated) are an essential ingredient, they pretty much take the back burner on this one to the characters living within the fence. I do love the imagery Carrie Ryan created of the Unconsecrated constantly scratching at the fences. It's so unimaginable that I love to imagine it. I only wish Mary wasn't so preoccupied with her mother's dreams instead of her own; in that way, I don't think I really understood Mary, especially since we only knew her mother for a short time. All in all, The Forest of Hands and Teeth is an exciting read that made me anxious beyond belief in parts. I did come away feeling a little empty with character development but I was still eager to get my hands on the next in the series to see if I could squeeze some more answers out of it. I have mixed feelings about this book. I enjoyed it for the most part, but I cant say that I loved it. In fact, Im a little disappointed. I have been reading so many raves about this series, that I just knew it would be great. And the first half of the book was great. Then, I spent 100 pages feeling as if I was reading the same story over again. It was too repetitive for me. I almost put the book back on my bookshelf to finish at a later time because I had lost interest. Luckily, the last 50 pages or so were interesting enough to make me want to finish reading. Another character that I liked was Travis. He was the broody male figure throughout most of the book. While he didnt say much, he shows that actions speak louder than words. Its easy to see how Mary fell deeply in love with him. What really makes me appreciate Traviss role is that fact that he is a broken man. Hes not the typical strong, healthy hero. He has a lame leg that limits much of what he can do, even the simple things like climbing stairs. If he were strong and healthy like the others I dont think his character would have worked as well. There needed to be something physically wrong with him to help illustrate Marys strong and dedicated character. They were the perfect supportin many waysfor one another. Along with the characters, the idea behind the story was decent. Im not much of a fan of postapocalyptic literature, but I bought in to this book. The zombies walking around trying to kill the humans held my interest. It was an original take on zombies, at least with my reading experience. Also, I enjoyed looking for the subtle hints of our civilization while I read (i.e. references to New York, Coney Island, roman numerals, Shakespeare). It helped me understand just how far into the future the events in the book were supposed to occur. But thats pretty much where my fondness ends. The plot (for me) was only so-so. It started strong, but it fizzled in the middle. I began feeling like I was reading the same thing over and over again: Oh, the Unconsecrated are coming! We have to turn back. Why?! I can only read those lines so many times before they become stale. I understand the purposethe characters questioning of themselves and their situation is crucial to the theme in the bookbut I really feel like it was over done. In fact, what started as a quick paced plot began to lag in the middle of the book because of all the repetitiveness. As I said earlier, I almost gave up on the book. Luckily things do turn around and the plot picks back up. As soon as Mary makes her final decision, the plot picked back up. Unfortunately, that was the end of the book. There were only around 20 pages remaining in the book at that point. it! How can it not be exciting? But somehow Carrie Ryan made it boring.